Do you think you could shrink #77, for me, please? I just love Haleigh's avatar, it is so peaceful. I also love 77's, beenie copter and his hairdo. If there is anything I can do for you, just let me know. Yours is kinda an everyday avatar, good for all the time, so I have not tried decorating you for the season, but I am always up for the challenge if you ever would like one! As you are a friend of cookie's I thought I'd design you an avatar to use if you want. Don't feel obligated to use any of these, but if you'd like to use one, you are welcome to it! And welcome to SM again! Wow Brandi, thank you so much, I love it, it's really beautiful. I have been looking at everyone's wonderful avatars and wondered how I could get me one, so thank you again and thank you for the instructions, they were a big help. You are very welcome, and I am pleased you like it! I used the same owl and made you a Christmas design also. I'll post it along with all the Christmas avatars when we are closer to Christmas. My signature line will indicate when they are ready and where to get them. I am going to try again, tomorrow. I love how you outlined 77's hairdo. Thank-you for your great patience and nifty talents. 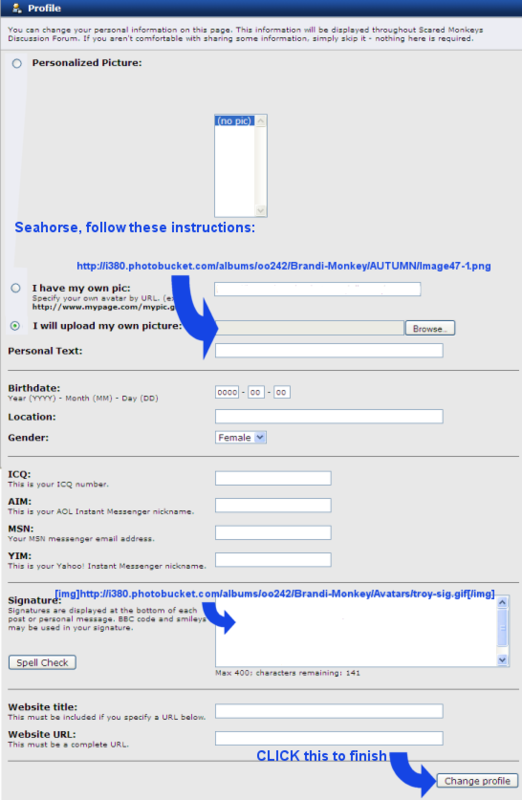 Seahorse, I made these instructions for you to get as your avatar, and as your sig image. I believe that is what you are trying to do. 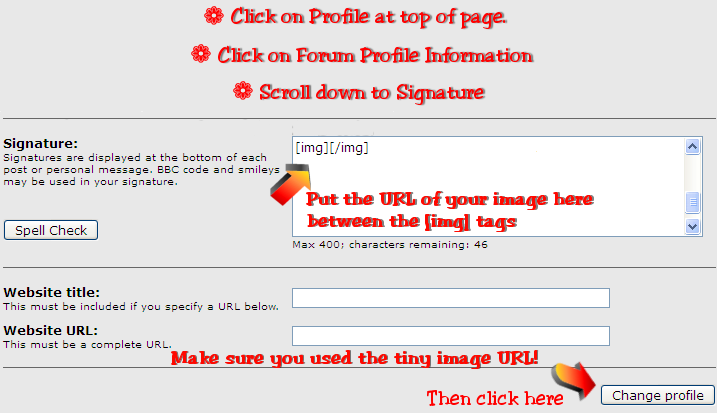 Clear all the boxes first, then add the avatar URL, the sig image (as shown) and click Change Profile. You have a lot of Patience, Brandi. I don't know how you understand the requests. Can you make me a pink yellow bird man monkey with yellow green dots a pink hat, no a scarf with a hat, with high heels, no boots on his head feet and a green mask with a yellow orange pumpkin, maybe a gourd and blue ears, but not regular ears, the ones you made me 2 years ago on a Sunday when the Eagles scored a touchdown against Dallas? Bearly, you forgot to add upside down and backwards with a big nose! I just love coming in here and looking. Brandi, you light up my life! Second design, holding pumpkin, gremlin in grave coming up, holding bat, pumpkin on ground, and holding pumpkin, gremlin coming out of hole in ground! I was " online" at first showing the Purple hat Monkey up until about an hour ago - Now I am a blank --- removed from photobucket. This happened to me before, remember I told you. What AM I doing Wrong??? About an hour or so ago, I moved some avatars in my photobucket account. Most of them were very huge files. One of them was the one with the purple cowboy hat and the time-lapse cloud background. That one is over a MB big. That's a lot of bandwidth every time it is viewed. I thought you had said you saved all yours I made. I suggested you post it to your photobucket account and be sure you linked to that image there. I thought you had done that. I also suggested if you want, you can upload it to SM forum to use it. I will move it back to where it was for tonight, but because the image takes so much bandwidth, I need you to upload it to your photobucket account and link from there to use or upload it to SM forum by clicking the THIRD radio button: "I will upload my own picture" option. Brandi No worries. I thought I did something wrong. I have saved your avatars from the past. Don't do anything special for me. It's not worth the trouble. That it all I wanted to know is if I had done something to make my avatar fail. Thank you for your reply, I thought now what .. omg .. Me thinking I was savvy enough to figure it out on my own. I am using the first one you made for me - As always you're the best. I see you uploaded the avatar to SM! Good work!!! I moved this one back to where it was. Feel free to upload it by clicking the THIRD radio button: "I will upload my own picture" option. like you just did with the other one when you want to use it. How is it that if I copy one of your avatars to my photobucket - and If I tweek it, lets say by just shrinking it .. why does it modify the avatar. You make the magic with the blinking eyes. Say if I were to just make " Your original/copied" smaller - why do the eyes stop blinking? Do you know? You need to "tweak" animated gifs with animation software. Photobucket does not have any software that will work for that. Their software will stop the animation. If you want a design I make "tweaked" please let me do it for you. I never knew, see what happens when you ask? I am going to keep my Deenie Lights for now. Your original You made me. I like it. Plus It reminds me of my Sister Northern. Had made this background some time ago, so I added your monkey and the bat in his hand. Thank you Brandi for another great design!! Glad you like it, MK!